Posted 11th September 2017 & filed under Blog. 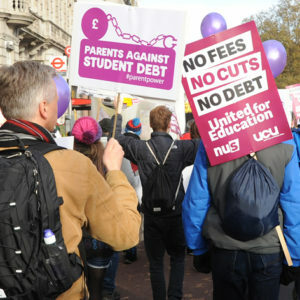 The government is keen to impress on students that they should not be put off going to university by the prospect of a £57,000-plus debt because they only have to pay once they are reaping the benefits of their education in post-graduate employment. The reality is somewhat harsher. A more honest statement might be: “As soon as you reach £21,000 you will be paying a marginal tax rate of 41% (20% income tax, 12% NI and 9% student loan repayment). You will be living in an ostensibly mid-tax society yet paying tax at the highest marginal rate in the world at well below average earnings of £27,000.” Yes, that even includes Sweden. If you are still thinking that’s no big deal you probably haven’t got a student loan. So let’s imagine the government says tomorrow “Look we are a bit short at the moment what with the NHS, public sector pay, elderly care, roads and power stations to build so we will be adding 9% to everyone’s tax rate. Hope that’s OK.” MPs will of course be able to set an example by paying an extra £4,770 personal tax a year. Ah! you say, but that’s different because students have consumed their education and so should pay! Well, for the last 16 years all of us in the UK have been consuming more public services than we pay for as the government borrows to fund spending deficits, kicking the national debt can down the road for future generations to take care of including, of course, those repaying student loans. The OBR estimates that the deficit will be £58.3bn this year alone. Shouldn’t we perhaps all be joining graduates in paying for the services we consume? There are reasons why the government isn’t going to tax us all 9%. The first is the obvious one that it would never be re-elected and the second is that putting tax rates up that high would not bring in all that new money as we all worked less, got creative in ways of avoiding tax or simply had far less to spend in the economy. The Institute for Fiscal Studies has recently reported that the likely yield of Labour’s planned tax rises would be far short of what simple arithmetic would suggest. Why would high tax rates for one sector of the economy – graduates – be any different? It is astonishing that taxing graduates at far higher levels than anything any party would propose for other taxpayers could be seen as sustainable. Researchers at IF are seeing worrying distortions in behaviour from high tax and debt burdens that are not just blighting young lives but damaging our economy in the long term. We think not dealing with student debt will prove far more economically damaging than the cost of alternatives and we will be reporting our research on this issue soon. In the meantime the drop in university applications this year – with many citing high debt as a big factor – suggests that more and more prospective students are worrying about the prospect.